The trip outlined in the newspaper article below has sometimes been put forth as the longest moped journey ever undertaken. See the page on this website: "A World Record?" 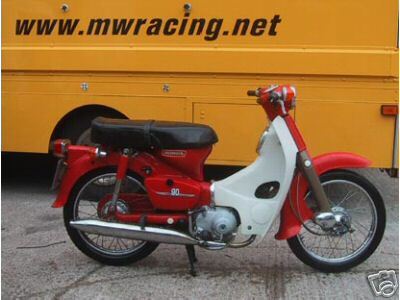 However, this is clearly erroneous, as Adam Paul rode a Honda C90, which is not a true moped at all but rather a small motorcycle. See photo below and after the article (below). I have reproduced this article here because the Guinness World Book of Records used it to turn down my claim for the longest moped journey ever undertaken. More details are below, after the article. Adam Paul should be working on his book, or washing his 80cc Honda step-through, but instead, he's been working on a forged "letter of invitation" to Russia. Not that he didn't get a real one in the first place, it's just hard to keep everything together while riding around the world. The current political situation across the Bering Strait doesn't help, either. "When the Soviet Union started to break up," said Paul, "Aeroflot, the state airline, just ceased to exist. People just grabbed the airplanes left at their airport, painted them up, and started new little airlines." Now, in order to add Magadan onto his Russian visa, he needs to have his 'letter of invitation,' which he lost somewhere along the way from Chile. Before Paul leaves Anchorage this week, he has to send a few articles back home to England, finish forging the "letter of invitation," pack his bike in a crate so it doesn't get destroyed in transit, and figure out if it's even possible to ride such a tiny vehicle across the Siberian tundra. And it's all in the name of getting a free trip around the world. 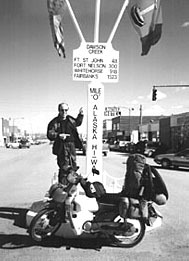 Paul's current journey began in March 1996, when he set out from Cape Horn, Chile, trying to become the first person to ride from Cape to Cape; Cape Horn, South America to the Cape of Good Hope, Africa. He might be the first to complete the trip and he's almost certainly trying with what will be the smallest vehicle to complete the trip. So, what is a step-through exactly? "It's not a scooter, because technically a scooter has a floorboard running along the bottom. And there's no pedals, so it's not a moped like you have here in America. Actually, they don't even sell these things in your country, but I think that the proper name is 'step-though.'" Once Paul finishes, he will be forever enshrined in the Guinness Book of World Records for the smallest engined bike to go around the world. "I think that I'm also doing the first Cape to Cape motorized trek as well, but I'd be surprised if no one else had ever done it before," said Paul. Paul's first long distance motorcycle trip was from England, across the Sahara, and finally to Ougadougou and Togo in 1990. He came up for the idea of riding from Cape to Cape after completing his 1994 journey across Europe to India in the fall of '94. Leaving his home of Chester, England, he rode his Suzuki GS 500 through Europe to Istanbul, and finally India. "The most spectacular part of that trip was the fortress of Jazilmir. It's built on the only hill on this huge flat plain. After Boy George left Culture Club, he went traveling to India, and I think that he made a video or something at Jazilmir." Shipping his bike from Mumbai, formerly Bombay, he met up with his friend Nilou, who accompanied him across Australia to wind up the trip. As the rides got longer and longer, the ride around the world, originally a prep school daydream, became more of a practical possibility. "After finishing the India trip, I thought I could ride from Cape to Cape. I went to the big English motorcycle show expecting to find a sponsor to shower me with equipment and money," Paul said, laughing. "Of course, it didn't quite work out like that." Although the motorcycle manufacturers were universally disinterested, Piaggio, the company that builds Vespa scooters, almost immediately started building a special scooter for the trip. Company leadership changes at Piaggio, however, left Paul in the lurch. After more than six months of planning, it was back to square one. Even though the scooter company had left him, the idea stuck. According to Paul, "The whole motorcycle scene has this image of the greasy, long-haired rocker type. Who's interested in having a biker ride around the world? But a scooter, now that's a whole different issue. In England, people's grandmothers ride back and forth to the grocery store on scooters. It had a broader public interest." Despite the appeal, Paul was forced, at first, to finance the voyage himself. Even English charity organizations like Save the Children turned him down. "The last message I got was, 'We don't want to sponsor you because we don't want our name on your body when they find it.' It was ridiculous; the people who run these charity organizations drive around in fancy company cars. A few of them would let me give a check in order to wear their name." Luckily for Paul, traveling by step-through is a relatively inexpensive proposition. He chose the Honda for reliability and parts availability; the bike cost around $2,100. "They haven't changed the design much since the '50's, so it must be pretty good. And you can get the parts anywhere around the world." Only after traveling to Argentina to start the trip did his voyage catch the eye of Honda's publicity department. Now, Honda foots the bill in return for as much publicity as Paul can drum up. And there's the matter of the promotional tour. "I have to do three big cycle shows after I get to Capetown. Honda is giving me a Blackbird, which is their top of the line superbike. They want to do some kind of ad thing showing the bottom of their line alongside the top of their line." The Blackbird, with a 1300 cc engine, has over 16 times the displacement of Paul's step-through and would have little to no chance on the dirt and gravel roads his 80cc commuter has faced. After spending more than two years haggling with visas and sponsors, the actual trip has been relatively uneventful. Despite carrying 35 kilograms of luggage, there have been no major problems with the bike so far (good advertisement for Honda). Paul has never gotten under 100 mpg on his trip, and his top speed, attained while riding down a hill in Peru, was 52 mph. More out of the ordinary, however, was one little incident in Colombia. "I was riding downhill on a three-lane highway with a truck on one side and a car on the other when a little old lady came tottering out onto the road. Since neither of the other two vehicles would back off, I ended up hitting her and doing this big slide on the pavement. Of course, her head immediately starts bleeding, I fly off the bike, and about 50 angry Colombians start shouting at me. The police came in a few minutes and we all went off to the hospital. "I ended up paying $20 to the doctor, $10 for medicine, $20 for her compensation, and an extra $15 to the police because ... well, because everyone was getting money our of the thing. The next day at the hotel, I was changing the oil on my bike when a policeman and company were heading right towards me. I thought, 'Uh, oh, this is for me.' It turns out that the policeman was the old woman's son, and he wanted more money. Finally, it wound up with all of the gringos from the hotel on one side and the Colombian police on the other. The British Embassy wasn't answering the phone, and that's like the only country in the world who you can always count on for help!" Later, after being robbed in Peru, Paul found he was becoming a legend on his own ride. At a roadside restaurant, "I listened to some guy talk about this crazy Brit who got robbed while riding a scooter up from Argentina. I was listening to some guy tell a story about me!" While on the Alcan, Paul found that a short interview with a reporter in Dawson Creek led to a front page spread. Paul sees the publicity as a necessary evil - something that has to be done to pay for the trip. "I have absolutely no desire to be famous," he said. Riding a scooter - sorry, a step-through - is according to Paul, "a lot more fun" than working a regular job. "I owned a couple of record shops for a while, but it's a little too late to become the next David Geffen, isn't it?" According to the Guiness World Record rules, Paul has to ride from the point farthest west on North America and then must start riding again at the earliest point possible in Asia to get credit for the trip. He's already ridden down to Homer to complete the first requirement. Later this month, he'll fly to Magadan to start the next leg. That is, of course, if he gets his new letter of invitation done in time. Adam Paul, barring any major disasters, will arrive in Cape Town, South Africa in the winter of 1998. He hopes to get the book out for the Christmas market. "The publicity from the trip will obviously help sell anything I write about it," he said. "Who's going to read about me if they've never heard of me?" This motorcycle (actually a "scooter") is clearly not a moped. DEFINITION: Under The Highway Traffic Act, a moped means a motor-assisted bicycle that must not weigh more than 55 kg (120 lbs. ), its engine displacement must not exceed 50 cc, its maximum attainable speed on level ground must not be more than 50 kmh (30 mph) and it may not have a hand or foot-operated clutch or multi-speed gearbox. A moped (motor-assisted bicycle) must also have pedals which are operable to propel it at all times. The Honda C90 has manually shifted gears, an engine displacement of 89cc, and no pedals.